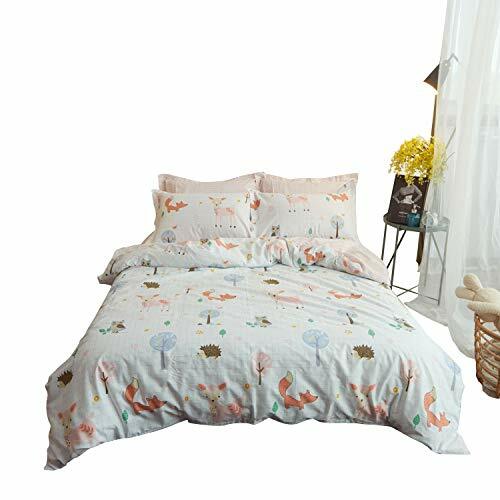 Transform the bedroom into a relaxing place with this simple, yet stylish, special animal pattern print duvet cover set. Crafted of fine soft cotton in bright colors, this nature duvet cover brings superior comfort and chic elegance to your bedroom. 1. 100% Cotton - Hypoallergenic; Purity of our extra-long and plush fabric makes our cotton duvet cover set softer, more durable, more breathable and more vibrant than regular cotton. 2. The duvet cover and matching pillow shams features a chic pattern, add a touch of stylish to your room easily, and features a hassle-free hidden zipper closure, easy to get your comforter in and out of this cover. 3. Style simple and fashion with designed patterns, which will offers you a warm feeling at home to enjoy nature, excellent gift for your family kids or your friends. 3) Due to the differences in computer monitors, actual products may have a slight color difference with the picture; For the different manual measurement ways, there may be 1-2cm(0.3-0.8inch) error. QUALITY GUARANTEE: Made of 100% cotton fabric for super softness,fluffy, non-shrink,durable and easy care,longevity and luxury. ZIPPER DESIGN: Duvet cover has hidden zipper closure and corner ties, metal zipper closure is easy for you to put your comforter in and out and corner ties inside is convenient to keep your duvet insert in place. This durable hotel quality comforter cover suitable for all seasons. EASY CARE-----Machine wash on cold, tumble dry on low, and low rion when needed. If you have any questions about this product by Buildingdream, contact us by completing and submitting the form below. If you are looking for a specif part number, please include it with your message.